Standley Lake High School freshmen Kaitlyn McCubbins and Delaney Huetson stood among classmates Sept. 1, watching as BMX rider Coco Zurita repeatedly launched from the half-pipe set up in the school’s parking lot. 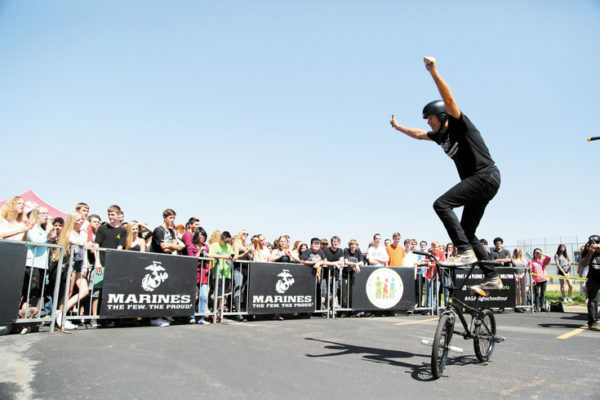 “There was a really cool guy on the bike,” McCubbins said, referring to Zurita and his many high-flying flips. 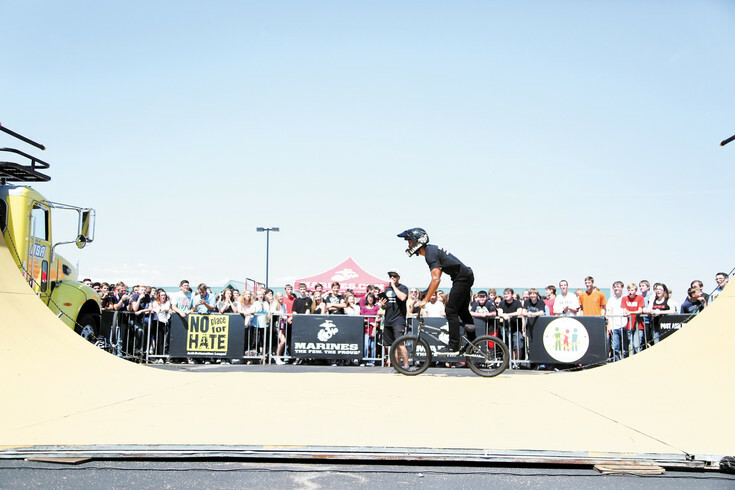 Zurrita was among five X-Games athletes that awed Denver-area students during the ASA High School Tour, part of the national No Place for Hate campaign to stop bullying in conjunction with the U.S. Marines and the Anti-Defamation League. 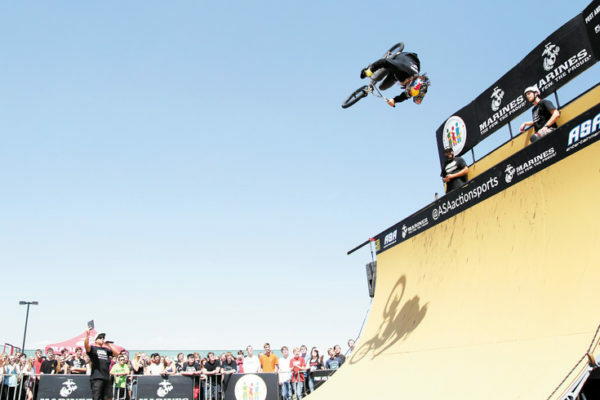 Other athletes on the tour were skateboarder Paul-Luc Ronchetti and BMX riders Trevor Meyer, Alex Landeros and Mykel Larrin. Which is exactly the goal of the tour, said Taylor Dressler, content coordinator for ASA Entertainment, which provides athletes for the events. The Colorado stop was the first a 14-week tour. Other schools visited in the area were Aurora Central High School, Prairie View High School in Henderson, Columbine High School in south Jeffco and George Washington High School in Denver. According to the Anti-Defamation League, 160,000 students across America miss school every day because of the fear of being bullied. The statistics shocked McCubbins, who said she learned bullying happens a lot more than she thought. The message about bullying is clear in schools today, Assistant Principal Trip Sargent said, and students are forthcoming about reporting bad interactions. But the challenge, he said, is determining if a student is having a bad day and a negative interaction with another student, or if that student is a bully and is specifically targeting others. • One of every four students — 22 percent — report being bullied during the school year. • 64 percent of children who were bullied did not report it. • More than half of bullying situations stop when a peer intervenes on behalf of the student being bullied. • School-based bullying prevention programs decrease bullying by up to 25 percent. • The reasons for being bullied reported most often by students were looks (55 percent), body shape (37 percent) and race (16 percent). • 90 percent of teens who report being cyberbullied have also been bullied offline. • 81.9 percent of students who identify as LGBTQ were bullied in the last year based on their sexual orientation. • One-third of girls and one-fourth of boys report weight-based teasing from peers, but prevalence rates increase to approximately 60 percent among the heaviest students. • Students victimized by their peers were 2.4 times more likely to report suicidal ideation and 3.3 times more likely to report a suicide attempt than youth who reported not being bullied. Mykel Larrin was one of five action sports athletes to perform for students. 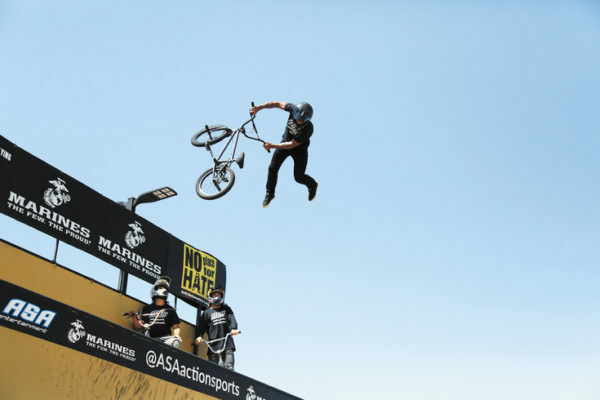 Mykel Larrin competed in the 2012 and 2013 X-games in BMX vert. He was one of five athletes on the No place for Hurt campaign in Colorado this week. Alex Landeros warms up on the half-pipe while students at Standley Lake High School make their way to the parking lot for the presentation. Trevor Meyer has won three X Games Gold Medals. He was part of the crew touring Denver-area schools. Paul-Luc Ronchetti, of England, is the only skateboarder on the 14-week tour, which kicked off in Colorado. BMX Pro Athlete Coco Zurita shows off big tricks Thursday, Sept. 1 at Standley Lake High School during the ASA High School Tour, which brings awareness to bullying prevention.